Portsmouth produced a Jekyll and Hyde performance to come from behind and beat Sheffield United at Fratton Park. Pompey were strictly second-best in the first-half as they trailed to Rob Hulse's header and Danny Webber wasted chances to extend the Blades' lead. A transformed Pompey turned the game round after the break, triggered by Rob Kozluk's own goal. 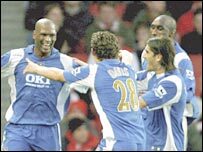 Sol Campbell headed his first goal for Pompey, and Noe Pamarot scored a carbon-copy third from a corner. Sheffield United made the perfect start by taking the lead while many were still taking their seats. Webber latched on to a long free-kick and waited for support in the form of Stephen Quinn who in turn laid the ball into the path of Derek Geary whose cross found Hulse leaping between the static Linvoy Primus and Campbell to head home from six yards. 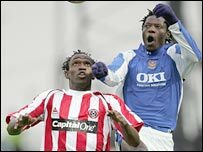 Kanu produced a hint of magic to provide a cross for Benjani to place a weak header straight at Paddy Kenny, but the early signs were that Chris Morgan and Claude Davis were going to discover if the Pompey front pair had the appetite for a stern physical test. Sheffield United certainly showed an insatiable appetite for work, and led by Phil Jagielka, they allowed Portsmouth no time to settle on the ball, and were swift on the break themselves. The Blades let Pompey off the hook on 27 minutes when Sean Davis completely missed a long ball out of defence, leaving Webber with a clear run on goal but the striker pulled his shot across goal with only James to beat. Webber's pace and willingness posed problems for Campbell who was unsure whether to stick or twist when the Blades striker dropped deep to find space and the ball. Pompey were labouring to break down a well-organised Sheffield defence and even when Matthew Taylor got forward to drive in a dangerous low cross, Kenny showed safe hands to cling on when any spillage might have proved costly. It was Sheffield United who created the chances as Pompey left gaps as they pushed on. Quinn was on the end of a well-worked move to fire straight at James, and Webber's pace again saw him burst between two defenders, only to screw an ugly shot wide. Pompey were out for the second half three minutes before Sheffield United and the Blades looked mentally still in the dressing room as Portsmouth scored twice in nine minutes to turn the game round. The equaliser came courtesy of an own goal when Benjani's low cross was deflected goalwards by Jagielka and despite his brave efforts to keep it out, Kozluk was credited with the own goal. Sheffield United's marking, which had been so solid and vigilant in the first half, disappeared when Campbell was not tracked and he rose unopposed to power in a header from Taylor's corner. If Blades boss Neil Warnock was unhappy with that, he would have been apoplectic with Portsmouth's third, when Pamarot was given the freedom of the six-yard box to head in the third. There was a flicker of resistance from the Blades, and James needed to be alert to prevent substitute Claude Davis providing his side with a lifeline. "As well as a team playing well, it showed a team that has a lot of character. "There's a great spirit in the dressing-room and that showed in the way we fought back. "People are talking about Europe but our first objective was to get enough points to stay in this division. After that we'll take it from there." "I have to bite my tongue because I don't want to give a lot of people pleasure by having to pay out money. "A referee of Graham Poll's standard should be able to spot it when the ball goes out off a forward's ankle. "He then failed to spot an obvious block on one of our defenders which gave Sol Campbell a clear header." Portsmouth: James, Johnson, Primus, Campbell, Pamarot, O'Neil (Kranjcar 90), Davis, Pedro Mendes (Fernandes 87), Taylor, Mwaruwari, Kanu (Cole 84). Subs Not Used: Ashdown, O'Brien. Goals: Kozluk 48 og, Campbell 54, Pamarot 68. Sheff Utd: Kenny, Kozluk, Davis, Morgan, Geary, Gillespie, Tonge (Montgomery 72), Jagielka, Stephen Quinn, Hulse (Nade 72), Webber (Kazim-Richards 75). Subs Not Used: Bromby, Armstrong.